I confess to having known next to nothing about the Gannet prior to obtaining this particular model – but wikipedia was once again my friend, helping me fill-in the blanks about this post-World War Two Royal Navy aircraft. I came across the model in question after learning through Whirly Fizzle that CLS Aviation, owned by CaithLynnSayes were being sold at L$10 per aircraft on an unsupported basis. At the time, I picked up a couple (see here for more). A subsequent chat about the CLSA range with friend Jodi Serenity led me to an impulse buy of CLSA’s Fairey Gannet – it’s not as if L$10 is going to break anyone’s bank! The first thing that struck me is that it is a comparatively big aeroplane (by the standards of the aircraft I generally fly, at least!). It is also something a very faithful reproduction by Helijah Bailey (sold under a licence agreement by CLSA) with a lot packed into it – more, it would seem, then the instruction manual explains. The complete package comprises the aircraft, a minimal but acceptable flight HUD for those who like them, a pilot’s headset and two manuals. By default, the aircraft rezzes with wings folded – these can be deployed when sat in the pilot’s cockpit by typing w(ing) or wings in chat. They unfold quite satisfactorily, and the twin turboprop engines can be started at the same time via the Engine button on the HUD if you use it, or by typing s(tart) or engine in chat – note chat commands are not case-sensitive. Starting the engines will also do a couple of other things – activate the Gannet’s strobe and nav lights, and cause the other two crew members pop-up in their respective cockpits (the plane is a single avatar seater). With the exhausts under the rearmost cockpit spewing fumes and heat, the ‘plane is ready to fly. This is achieved by releasing the parking brake (p) and then using the conventional controls: PAGE UP / PAGE DOWN for the throttle (5% increments or nX – where X is a number between 1 and 100, for quickly setting), UP / DOWN for nose pitch, LEFT / RIGHT for banking. In flight, the Gannet handles well – I’d rate it the best of the CLSA aircraft I’ve flown to date. Being a beast, it does require constant pressure on the controls with banking or it’ll simply try to rapidly straighten out, but this adds a level of realism in flying. Airspeeds are given in metres per second, and when landing, you’ll need around 8-15 m/s to both avoid stalling on approach or coming in too fast and having to force it onto the ground. As noted the ‘plane comes with plenty of features: the aforementioned folding / unfolding wings; a deplyable radar dome for anti-submarine warfare (ASW), the Gannet’s primary role in this variant and an extensible arrestor hook for deck landings (would that there were a Royal Navy carrier steaming around Blake Sea!). There are no fewer than 10 default camera positions and 11 preset paint schemes (5 Royal Navy Air Squadrons, one Royal Australian Navy Air Squadron (albeit it with UK roundels), one Indonesian Navy Aviation Squadron, 3 Marineflieger (German Navy) options, and one simply labelled “FAA” (Fleet Air Arm). There is also a custom option. There’s also a fuel system, a sliding pilot’s cockpit canopy, and a park / unpark mode (only use the latter with the wings folded, as it includes the stays to hold the wings in that position). The Gannet is also fully VICE enabled for combat operations – although this is missing from the flight manual. I’m not into combat flying and so blindly fiddled around until some things worked. Enabling VICE via the menu prims the weapons bay, and typing b in flight will open the bay doors and drop a torpedo (providing you have rezzing rights in the region you’re flying through). There is a cycle delay limiting the frequency at which torpedoes can be released. There are also weapons hard points under the wings with depth charges (I assume) and missiles attached. These are alpha’d by default, and appear to be unscripted. I’ve no idea if they can be accessed by this particular variant of the Gannet, or if they an hold-over from another design, and confess I didn’t spend too much time trying to figure them out. Overall, I found this a nice aircraft to fly – and one that is certainly nippy at high throttle settings, which offers some fun in flying. While it is not something I’d use with any frequency – only curiosity and the price caused my to buy it, as noted -, for those who like their military aircraft, it potentially offers a pretty good value for money, particularly given the preset finishes. C3rb3rus is fast becoming one of the top designers of atmospheric experiences in Sansar. I’ve already written about two of his designs – Darkwood Forest (see here) and The Diner (see here – although it is deserving of a dedicated write-up). His most recent design – 2077 – has already garnered a lot of coverage, which is why I held off writing about it immediately it opened. However, it’s not hard to understand why it is has been popular -it is visually stunning. This experience takes its basic theme from the style we perhaps most readily identify with the likes of Blade Runner – although I personally see it as something of a fusion between that and the short-lived TV series, Total Recall 2070 (itself a fusion of Philip K. Dicks We Can Remember for You Wholesale and Do Androids Dream of Electric Sheep, the inspiration for the original Blade Runner film). On arrival, visitors are placed on a long street – a canyon, if you will, formed by the flat faces of high-rise buildings, themselves surrounded by even taller skyscrapers which glitter with light. By comparison with the latter, the streets on which visitors stand seem dark, cold, and a little threatening. With graffiti on the walls and litter on the streets, this feels is if it is a much poorer part of the city than the horizon forming towers of light and colour. Perhaps those glittering towers are where status and wealth reside; the higher up residents are within them, the more their status has literally elevated them above the darker, poorer world flowing around the feet of their great glass-sided citadels. Perhaps this is why, flying cars zip back back and forth high above the streets, their passengers intent only on spanning the gap between lofty perches, and oblivious to what lies below, lost in the night. Nearer to the ground, more of these cars pass through the canyon-like streets, travelling a little more cautiously, while one or two have forsaken the air altogether – or have perhaps been decommissioned, like Deckard’s old Police spinner in Blade Runner, confined to crawling along the dimly lit streets. Dim though the lighting down here might be – the street lamps little more than thin lines of blue iridescence atop tall metal poles and which case cold pools of light beneath them – the streets are still alive. Digital advertising boards shimmer, turn, dance and project, adding their own illumination which reckons off the otherwise dull surfaces of roads and sidewalks. Walking the latter, it is possible to come across gaming halls and bars, or arrive at the corner of Walk and Don’t Walk as little green and red men flick back and forth on overhead signals, determining when it might be safe to cross a particular junction. Over all of this, a great hologram of a female face looks down, turning slowly from side to side, as if keeping a watch over the streets in her care. Not far away, a single eye darts side-to-side on a billboard, a pattern of digital lighting over the pupil for some reason putting me in mind of the Rekall chairs from Total Recall 2070. Elsewhere amidst this neon advertising one can find a hospital or clinic signified by both, a red cross and a ghostly skeleton rotating slowly above the entrance, Max Headroom close by, perhaps mocking passers-by. C3rb2rus likes to include motion in his designs and 2077 is no exception to this, as demonstrated by the ground and air traffic. But there is more; the spawn point in the experience, for example is under an elevated train track. Behind it (and easily missed), a ramp offers a way down to where a platform awaits. It is periodically visited by a subway train you can step aboard and ride in a loop around the build. I have no idea if this is indicative that more might be added to the build (there’s only the one stop at present), but it does offer a certain promise to the design. Nor is this all. Find your way to the high rise at one end of the main street, and ceiling lights will direct you to where an elevator regularly descends and rises. Step into it, and it’ll offer a trip up to a modest – bordering on austere – apartment, which in turn offers a grandstand balcony view back through the experience. Watch for a few minutes, and you’ll witness another nice touch,, as an air car rises from the far end of the street, angling gently upwards until it reaches one of the lower skyways and passes overhead. 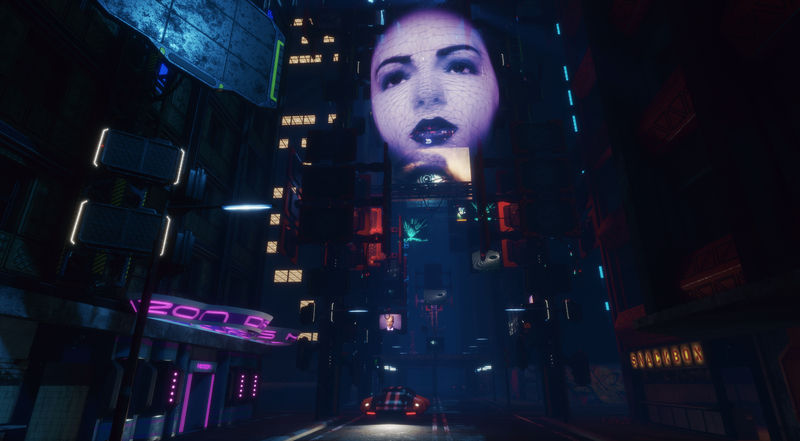 Given that so many Sansar experiences are, due to the nature of the platform at present – largely static, 2077 feels very much alive, almost vibrant beneath the hues of the backdrop skyscrapers. Atmospheric, rich in detail despite its dark tone, this is an experience offering a certain promise of what Sansar might become as a role-play environment, as capabilities are improved.